Broadband access to the internet at home has risen steadily since 2000, and the “always on” connection typically increases the frequency with which people use the internet and the variety of things they do online. Our December 2012 survey shows that 65% of Americans have broadband connections at home. 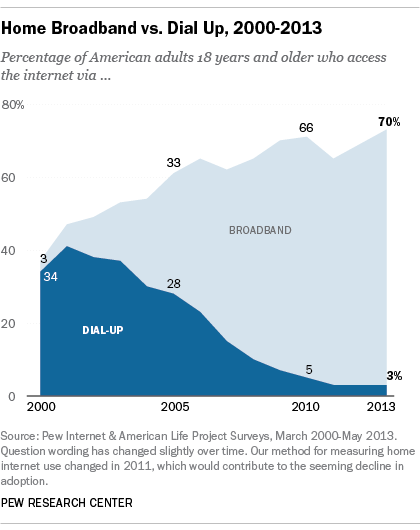 In June 2000, when about half of adults were online, only 3% of American households had broadband access. Now, as of December 2012, the tables have turned: 3% of Americans connect to the internet at home via dial-up. At 5%, Hispanics are the most likely group to have dial-up internet connections at home, compared with whites (3%) and blacks (1%). Interestingly, there are no statistically notable differences tied to community type: rural residents, city dwellers, and suburbanites are equally likely to be dial-up home internet users. In the spring of 2009, we asked adults who had dial-up internet what it would take for them to switch to a broadband connection at home. A plurality (35%) said the price would have to fall, and 17% said it would have to become available where they live. One in five (20%) said nothing would get them to change. Perhaps they just like the sound of a dial-up connection. For an update on Americans’ home internet connections, including home broadband and smartphone-only internet users, look for our new report coming Monday, Aug. 26 at 10 a.m., ET.